Who loves pizza? I love pizza! Pizza is the BEST. I also really love unusual pizza. You know, ones shaped like cars, Jack-o-lanterns, or made with chocolate bars. Here's what that looks like. Note that it also has miso katsu on it. Aichi, especially Nagoya, is famous for miso. Terriyaki chicken pizza with mayo—which is rather normal for Japanese pizza. But look at all that lettuce! That's not so normal. Valentine's Day pizza. How sweet! Crab claws. Please don't eat the claw part. A pizza box filled with cute little pizzas. This looks amazing. 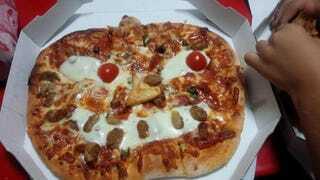 Last month, it had a special Halloween pizza. You can see what it looked in real life in the top photo. But Aoki's upcoming pizza might be its most unusual yet. This is a chocolate bar pizza. With pineapple. The candy bar is called Black Thunder, and it's a popular, yet inexpensive Japanese candy bar. So, naturally, this is called Pizza Black Thunder.